With Mother's Day just around the corner, why not do something unexpected and early this year? Usually, people take their moms out to eat and bring her some flowers. But this year, why not bring her to the flowers? Located in Carlsbad, CA, The Flower Fields are 50 acres of blooming colors. My mom learned about the fields on TV and desperately wanted to see them so we stopped by The Flower Fields before our trip to Legoland. As I mentioned in last week's post, I had leftover shortbread crust dough after making Taiwanese Pineapple Cakes so I used it to bake... 3D Hello Kitty Cookies! One of my favorite Asian sweets is Taiwanese Pineapple Cakes (鳳梨酥). For those of you who don't know, Taiwanese Pineapple Cakes are nothing like the traditional cakes we see in America. Instead, they're more like a thick, rectangular (or square) cookie with a shortbread crust enclosing a pineapple paste/jam filling. You see, the last time I went to Legoland was over a decade ago - around the time the park first opened! I remember there was only a handful of rides in the park and it seeming more like a museum of lego models. Fast forward to today and there are substantially more rides! However, I didn't end up going on any big rides because the lines were way too long! All the interesting rides had wait times of at least an hour, which I just wasn't really up for. (As a sidenote, Legoland really needs to make the signs for wait times a lot bigger. You basically have to walk up to the end of the queue before you can see what the little number says so it'd be nice if you can just see the wait time from a distance.) The only ride my brother and I did end up on was the BIONICLE Blaster, Legoland's version of the spinning teacups, and that was only because the ride had a 10-minute wait. Aside from missing out on most of the rides, I did enjoy Miniland USA, an area of lego models of major US landmarks. It was my favorite part of Legoland when I went as a kid and it still remains one of my favorite attractions. They have a mini San Francisco with the Golden Gate Bridge. There's a mini version of the Las Vegas strip. And a model Washington, D.C. as well as other major cities like New York, Los Angeles, New Orleans during Mardi Gras, and the New England area. One of my brother's favorite areas was Star Wars Miniland, where the Master Builders recreated scenes and planets from the Star Wars movies. My favorite had to be the fallen AT-AT. My family and I ate lunch at Costco (right outside the park) to save money, but we did splurge on Legoland's famous Granny's Apple Fries located in Castle Hill. These apple fries are made with Granny Smith apples, dusted with cinnamon sugar, and served with vanilla whipped cream. The tartness from the apples mixed with the batter and cinnamon sugar made it seem like we were eating a deconstructed apple pie, but without the thicker pie crust. I've never had anything like them before. Inside, you see tanks of fish, sharks, jellyfish, stingrays, and other sea creatures with lego divers and submarines. The entire aquarium takes about an hour to walk through and includes some interactive tide pools and trivia questions. I personally prefer the Aquarium of the Pacific in Long Beach, but it was interesting to see lego models in an aquarium. Overall, Legoland California seems like a great place to bring kids. Most of the kids I saw were 12 and under and you could see they were having loads of fun! I wish Legoland would instigate some sort of Fast Pass program so the wait times don't seem as long for rides though. However, "The Lego Movie Experience" pretty much made the trip worthwhile for me so be sure to read about that part of my adventure! For now, I leave you with this hilarious collage of a dad stepping on lego bricks - something most parents can relate to. Seriously, the Master Builders at Legoland have a great sense of humor. 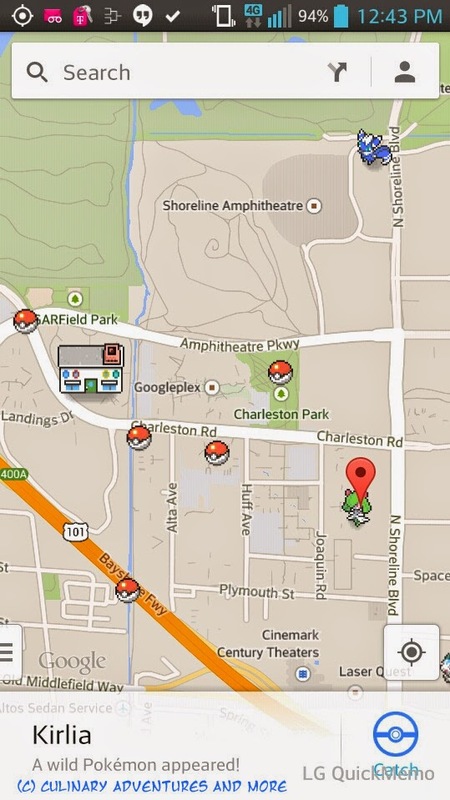 Catch Pokemon on Google Maps on April Fools' Day! One of my favorite things about April Fools' Day is seeing what fun pranks Google comes up with. Guess what, Adventurers! 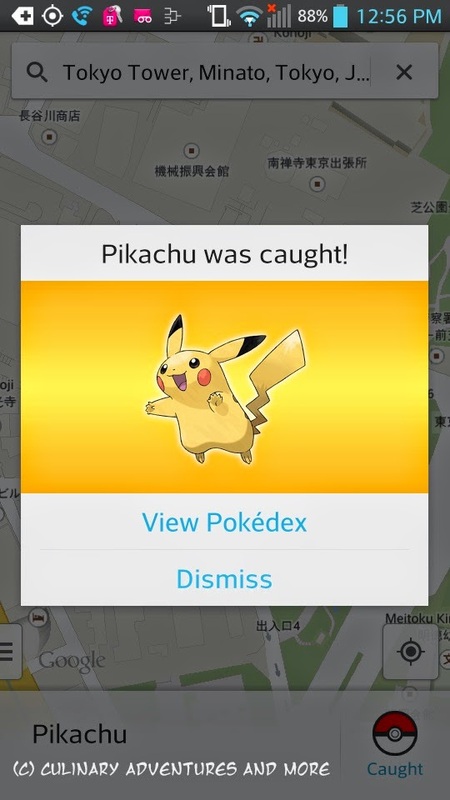 You can now catch Pokemon on Google Maps! No joke! There's 150 different Pokemon (both new and original) distributed around the world. After you update Google Maps on your Android or iPhone, click "Search" and then you can embark on your quest to be a Pokemon Master! How cool! Now if only we could pokebattle too! 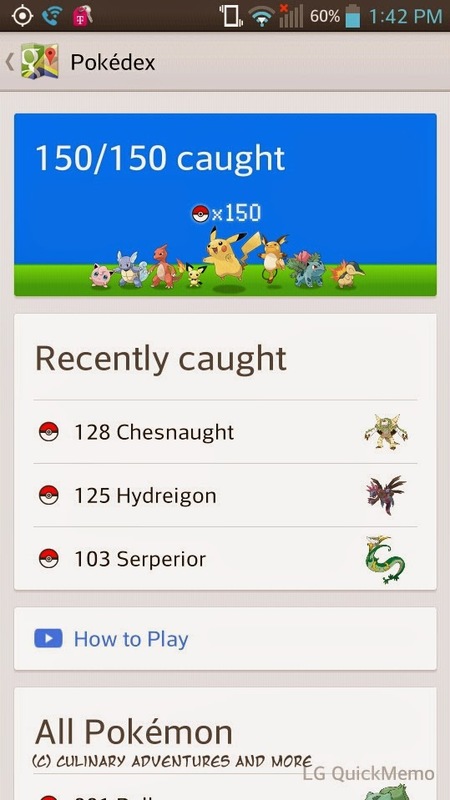 UPDATE: I finally caught all 150 Pokemon! 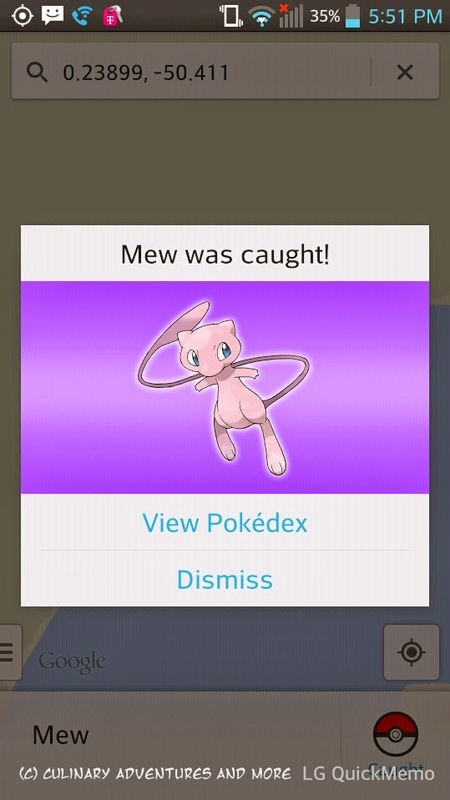 After you collect all 150, you unlock Mew! 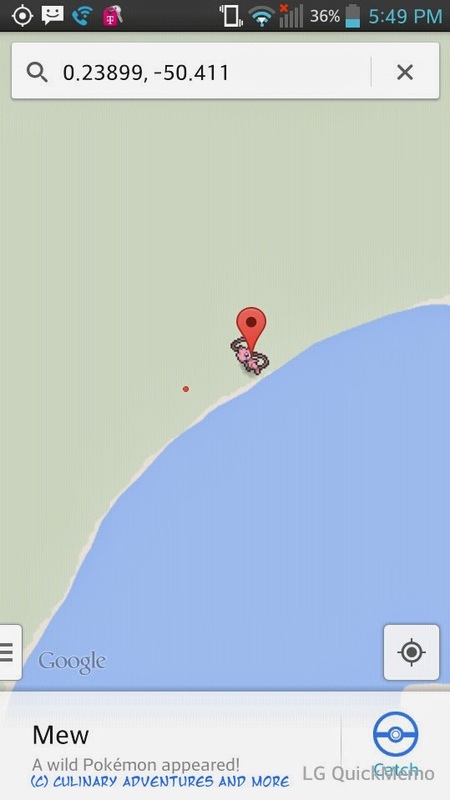 It appears that Mew is found in different locations for different people, but for me, he was at 0.23899, -50.411 (NE Brazil). It took me forever to find him! 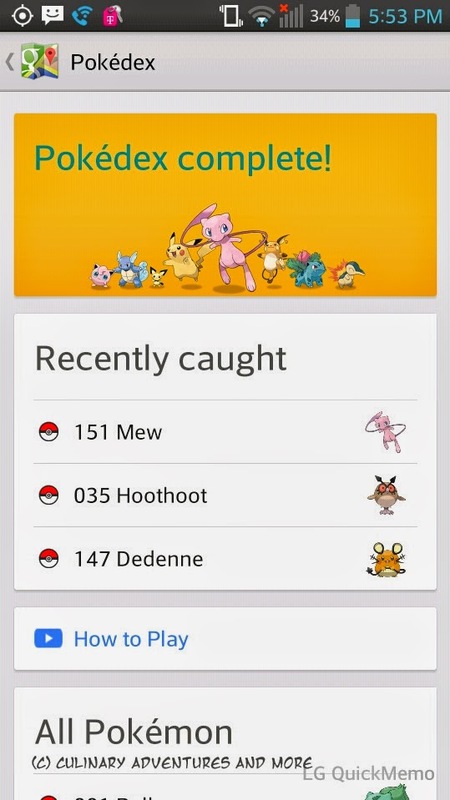 Once you catch Mew, your Pokedex updates to show it is complete. Now that was a long quest... Did any of you complete it? Where was Mew for you?